I have made this a few times lately, and it is so delicious... I may have neglected to take a picture myself. Thank you internet, for your wealth of images! I've been trying to eat less sugar lately, and while this technically still has some, it's got to be better than straight up brown sugar, right? It sure tastes better! Put the squash cut side down in a large baking pan, with about an inch of water in the bottom. Roast at 375* for about an hour. The squash will be done when it is soft when you poke it with a knife. 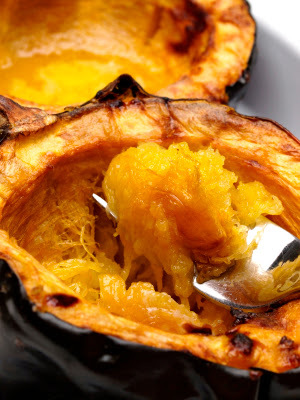 Remove squash from oven, and remove the seeds with a spoon or tongs. In the hollow of the squash, put half of the butter in each side. Then drizzle the maple syrup over the top. Lastly, add the coconut, and mix it together somewhat with the squash. Bon appetit!